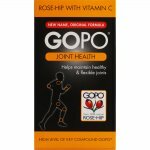 Gopo Joint Health is a unique food supplement made from specially cultivated rose-hip. Longstanding Scandinavian research projects, together with published scientific studies have established that GOPO - a key component of the rose-hip (Rosa conina) used in Gopo Joint Health - may play a valuable role in the care of joints and joint tissues. 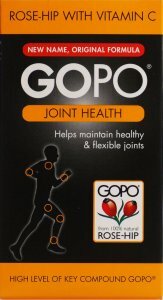 A special patented manufacturing process is used to ensure that Gopo Joint Health contains a high level of this key active component GOPO - making it a supplement with completely unique qualities. 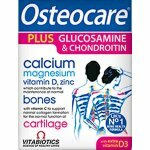 Gopo Joint Health is also rich in Vitamin C which is essential for normal collagen formulation, needed by the body for healthy bones and cartilage. Swallow with water, or split the capsule and sprinkle over food. Do not use if cap seal is broken when purchased. Rose-hip, gelatine, vitamin C (ascorbic acid). 4 capsules provide: 3g scientifically documented rose-hip powder with 524µg of GOPO (glycoside of mono and diglycerol) from date of production. 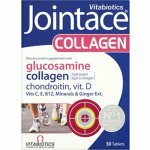 Also provides 40mg Vitamin C (50% NRV*). *NRV – Nutrient Reference Value.